Residents of Montreal Square in Romsey may face re-housing – and their homes may face demolition – while the square is redeveloped. 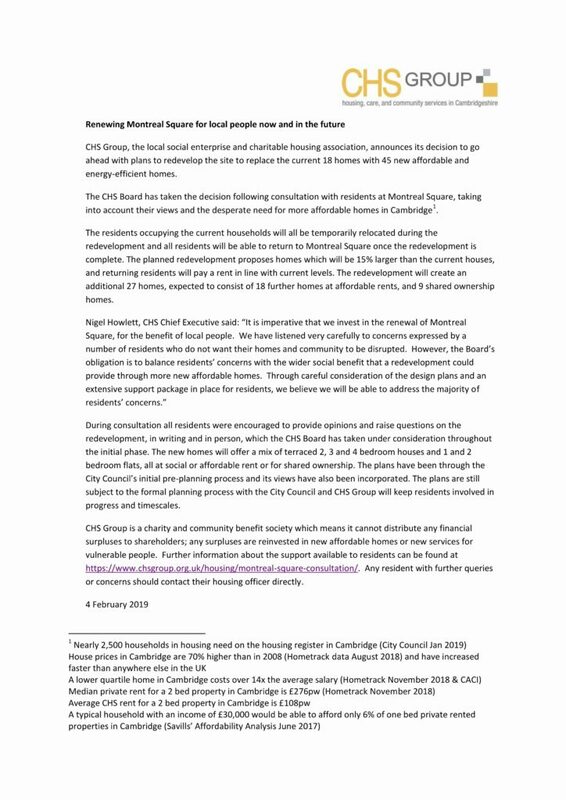 CHS Group (the trading name of The Cambridge Housing Society Ltd) claims demolition and re-development is needed to fulfil its charitable duty to provide as much social housing as possible. The loss of the square would not only mean the loss of well-loved homes and valuable green space, but also the loss of a vision of how housing should be, with areas that are individual and areas that are communal, with places to meet and to play as well as space to relish personal privacy. Mill Road TV came along to report on the Montreal Square Residents’ Association‘s fight for their homes. Follow Mill Road TV on YouTube andTwitter. 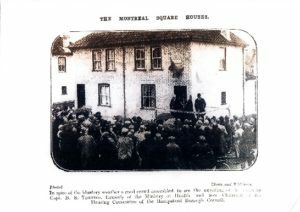 Montreal Square was built by Cambridge Housing Society which was started in 1927 by Alderman Conder, Councillor Mrs D Stevenson and Dr Alex Wood (after whom the hall in Norfolk St and the bus shelter in Petersfield are named). The CHS was set up to help families who couldn’t afford market rents. When the Montreal Square houses were built they didn’t have a separate bathroom but had baths in the back kitchen with a lid over it to form a table. They were still very popular with the first residents. 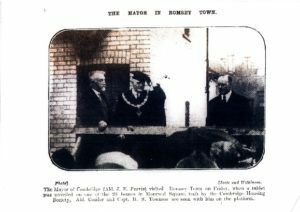 As reported in the Cambridge Independent Press of November 30th 1928, the Mayor, Alderman J.E Purvis visited Romsey, and a plaque was unveiled which can still be seen today. Mill Road TV came along to video an update on the Montreal Square Residents’ Association‘s fight for their homes. 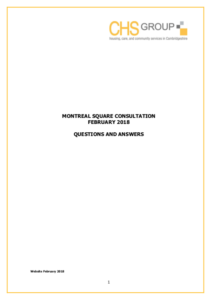 After our last meeting in May which ended in a stalemate as we were not prepared to go forward and discuss the best way to Demolish our homes, CHS asked us to discuss with residents if they wanted us to discuss a design brief for the development of Montreal square. As the majority of residents still remain totally against the idea of destroying homes and a well established community the answer was a resounding NO. On the 5th June we sent a letter to CHS to inform them of our decision advising them that we could not continue with their consultation period which only had the aim of doing a design brief. Attached is a copy of the letter all residents received from CHS last week. Again CHS choose to try and divide the community by asking the minority to go against the majority and get involved in a design brief. We are still doing every Saturday afternoon outside the Co-op on Mill Road collecting signatures of support from the local community. With the online petition and the hard copy from the Co-op we have over 2,000 signatures of support now. CHS have said they will get back to us by the end of July. That, by July, is over 6 months of stress and anxiety for the residents with the possibility of a lot more to come yet. Thank you for your letter of 5th June, received last week. We note that many of you remain opposed to any redevelopment. Your letter also clarifies that the strong sense of community among Montreal Square residents is based on shared social values and responsibilities, which add to the pleasure and wellbeing from living there. As agreed at the first public meeting in February, we will move on to develop options for a redevelopment scheme, working with any residents who wish to have further input. We assume from your letter that the Residents Committee is choosing not to participate in this, but we are very happy to involve them if they wish. These options will be shared with all residents. We will get back to you by the end of July to outline how a decision will be reached. The panel of Board members that met with the Residents Committee has already accepted the invitation to visit Montreal Square and remain happy to do so if you would like to suggest some convenient times. In June we said we would let you know by the end of July how the CHS Board will reach a decision on the future of Montreal Square. This letter outlines what will now happen, so that the Board can make a final decision at their meeting in mid October. To reach a decision, the Board will need to weigh the problems that would be caused by a redevelopment against its advantages, mainly extra affordable housing. To develop an outline design, as requested at the first public meeting, that will include all the feedback you and your neighbours have given us about how any redevelopment would affect you and what you would want in a potential scheme. To give you an opportunity to comment on this potential design before this is presented to the Board. To get an indication from the City Council Planning Department that the outline scheme is likely to meet their requirements. This is so we can be reasonably confident that the Board will be considering the advantages of a scheme that might be able to go ahead if they decide to proceed with redevelopment. It would also reduce revisions and delays both before and during any planning application stage. To develop outline costings to make sure that the potential scheme is affordable for CHS and would deliver value for money in terms of additional affordable housing. The Board will carefully consider what many of you have told us about the impact that any redevelopment of Montreal Square would have on you. Although we understand that the current uncertainty is very uncomfortable for you, the earliest we believe we can produce all this information is by mid-October – which is an ambitious timescale for a scheme of this nature, especially as many aspects of the process are not within CHS‘s control. If the Board decides in mid-October to go ahead with redevelopment, further work would then be required to submit a planning application and go through the approval process, all of which typically could take between 12 and 24 months. to visit you on 2, 7, 8 or 9 August. Please call our Customer Services Team on [✂︎] or email [✂︎] to let us know when would be convenient. The campaign to try and save our homes at Montreal Square, Cambridge, is still in progress. Back at the end of January Cambridge Housing Society told residents they wanted to look at the idea of DEMOLISHING Montreal Square to build more properties on the site. Some 6 months later we are no further forward to them making a decision about this proposal and have just had a letter telling residents they will not make a decision until mid October. Their initial decision was going to be made in March. Since March we have done what CHS had requested of us. We have set up a democratically elected Montreal Square Residents Association at their request and we have attended three meetings. At our last meeting we were asked to discuss the best way to DEMOLISH our homes. 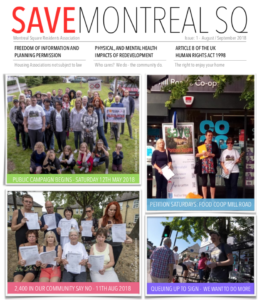 Unfortunately as we represent the majority of residents at Montreal Square it was decided that we could not continue with any steering groups or engagement panels that involved any design briefs because the majority oppose this idea. 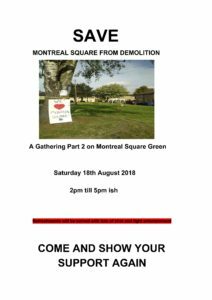 CHS have since chosen to ignore the Montreal Square Residents Association and have again offered residents individual meetings about the redevelopment in order to try and get some residents to work with them against the majority of residents. Our campaign has had over 2000 signatures saying NO to this idea. We believe now the only thing keeping this idea afloat is CHS’s obsession with trying to increase their revenue for this site. Maybe their enthusiasm for this site would be better directed at maintaining the site better as very little as been done in the last 10 years. The last story about Montreal Square was on the 16/05/2015. Residents including the elderly and vulnerable feel it’s time to end this and allow us to live in peace. Residents fighting plans to bulldoze their homes to make way for a new development say they “will not be broken”. More than 1,300 have signed a petition on change.org calling for a halt to proposals to demolish Montreal Square in Cambridge. 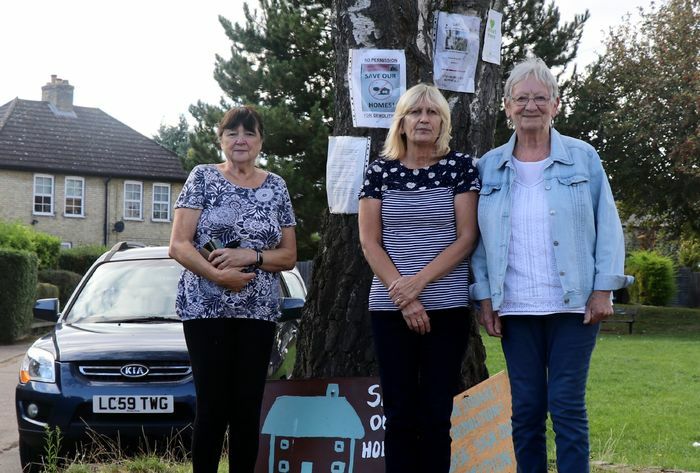 The residents, some of whom have lived in the square for more than 40 years, say they will continue to fight the plans being consulted on by charitable housing association CHS Group. They have now gathered the support of Cambridge MP Daniel Zeichner, who says he cannot support a plan opposed by the community. Mill Road TV filmed the gathering and interviewed some of those present. And Mick Brown, aka Lord Drainlid, captured the mood of the gathering. Follow Mick Brown’s YouTube channel, or as Lord Drainlid on Twitter. Now Montreal Square features in a double-page spread in the 28 September 2018 edition of Varsity. I am writing to you to ask if we can come and visit you. 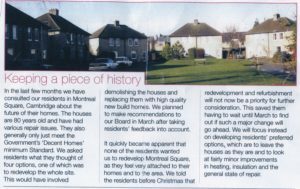 The reason for this is that we need to ask for your views about the long term future of the houses at Montreal Square. CHS has begun a review due to the age and condition of these houses and we want to talk to you about the next steps. Your Housing Officer Doug Stother would like to call on you personally at home on either Tuesday 19th October or Wednesday 20th October. He can come morning, afternoon or early evening. We have provisionally set a time of approximately 3:45 p.m. on Tuesday 19th October for Doug to visit you. However if this is not convenient, or you would prefer to meet somewhere else, then please do let us know and we will agree a more convenient time and location with you. Doug works out of the office a lot of the time, and so it will not be easy for you to call him direct if you need to re-arrange the visit time. Therefore would you please call our Customer Service team on 0300 111 3555 who have access to Doug’s diary and can re-arrange the time for you. I am sorry if this letter is quite short notice of our visit – we have assumed that you would be keen to ﬁnd out more about this as quickly as possible once we wrote to you. Last Monday I met with a group of residents from 10 of the houses in Montreal Square. We talked through what the next steps might be following our decision not to now pursue the option of redeveloping the Square to provide new modem homes. The feeling of the meeting was that you wanted CHS to leave your homes alone and just make sure that we would carry out repairs and maintenance to keep your homes above the Decent Homes Standard. The meeting did not want us to explore more significant improvement options and the problems of funding these. I explained to the meeting that while CHS was keen to be led by residents’ views about redevelopment and improvement it was possible that in the longer term we would have to you about this again. This is because we might well need to carry out some major works at some point in the future to ensure we provide homes that are more affordable to heat and maintain. I want to stress that we have absolutely no plans to do this but it is fair that I should explain that this might be an issue in the future. I am writing this letter to make sure that everyone is aware of the latest position. Last weeks meeting identified a number of building issues, including the need for some boiler replacements and loft insulation. I suggest therefore that the best way ahead is for us firstly to survey the condition of the houses in Montreal Square to draw up a complete plan of any work needed now or in the near future to make sure that we can keep them above the Decent Homes Standard. We propose to carry out surveys using our own property staff, starting in January, and at times agreed with each of you. A question was asked about flushing through heating pipework and I can confirm that this is done as part of all our new boiler installations. We will let you know in January if you have a boiler that we plant to replace in the next few months. On the 27th October 2018 Daniel Zeichner. Cambridge’s Labour MP, spoke to over 80 people who gathered to march the length of Mill Road in support of our campaign to save our homes. He said He could not support anything not supported by the Residents and that he recommended that CHS talked to residents at not at them. Liberal Democrat Councillor Rod Cantrill also joined the march and told everybody who had marched to Montreal Square that this is something Cambridge Liberal Democrat are against too. After issuing a press release (shown below) CHS Group informed their tenants of their fate a little later in the day. Download this statement as a PDF (426 KB) Opens in a new tab. Note the published time from the source code. Montreal Square represents all that is good about Mill Road – a small , stable community of social housing that you would not know were ‘social housing’, set around a green ‘common’ that provides a welcome open space shared with neighbours in the surrounding streets of more densely packed terraces. Mill Road with all the new HMOs and student flats badly needs a stable community like this to help create a sustainable community for the future. One of the chief attractions for many residents are the gardens, which they love as a place to sit in the sunshine, to grow flowers or vegetables, for children to play in or for older people to relax in. In a small house like these the garden is often the biggest ‘room’ in the house. 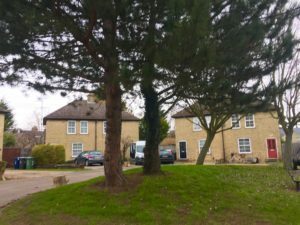 Cambridge Housing Society now wants to build over these gardens and demolish the existing houses – which if they need updating could be updated just as the far older terraces have been updated in the surrounding area. The residents are victims of a broken planning system that fails to provide suitable building sites for social housing in more appropriate sites. Cambridge Housing Society are also victims of the same broken planning system. But they should no better. This is an attempt by them to meet their ‘targets’, at the expense of the residents whom they are meant to care for. Living with Community Cohesion is something we took for granted here at Montreal Square, with lifts to hospitals, shops part of the norm but not only that it also goes a long way towards mental & health well being. 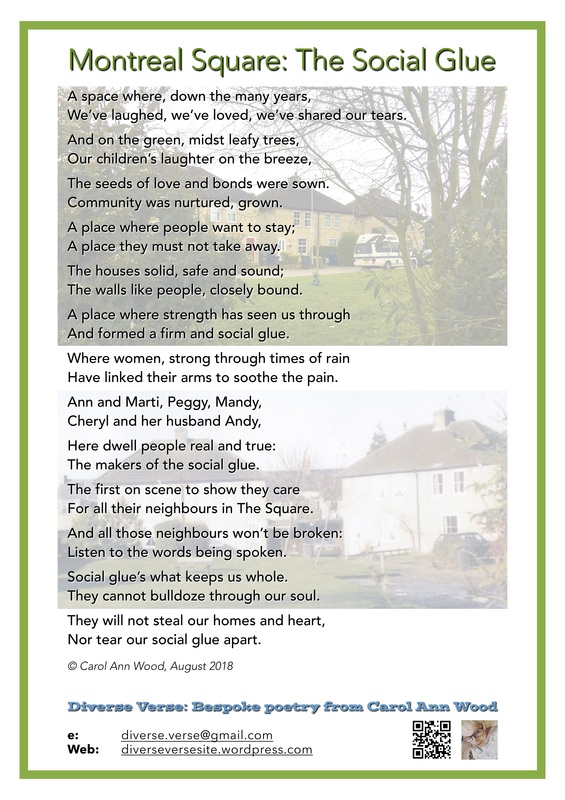 This is something that is close to our hearts which is why we have a campaign going in the hope of saving not only our homes but our community as well. The green space is like Romsey’s village green and the local community have asked us to do what we can to save it. Saving the green space will save the trees and the wildlife. Romsey is already one of the most populated areas in Cambridge. We would like to thank everyone for their support from Montreal Square Residents Association. Previous Previous post: A traffic-free Mill Road?